Subject: The (Mini) Details of Dr H: Now Building: Ancient / Now Painting: Malignant Plaguecaster. Nice work on the plaguecaster. Looks great! Subject: Re:The (Mini) Details of Dr H: Now Building: Ancient / Now Painting: Malignant Plaguecaster. Looks like the gods of auto-correct really hammered your here, Theo'. I've gone for red though, as looking at him, a brown hood would merge with the horns and this red matches the (slightly more purple) guts hanging out and spreads that colour across the model, making it a good counterpoint to the orange and green. And it keeps him colourful, which is the aim of this model. Had not put any thought into his colouration yet. I'm tempted to do a half or quartered scheme to stay with the heraldic theme of a chap with a large flag. Gitsplitta wrote: Nice work on the plaguecaster. Looks great! Here is progress on the plaguecaster. And the staff now done with the diseased wood (normal wood colours, red wash over diseased pieces, black dry-brush over those areas). Tentacles, magic and goo still to do. Sure enough autocorrect flubbed it again. That and my limited time to double check my posts. Should have been soiled not smiled. Oh well, red looks good . 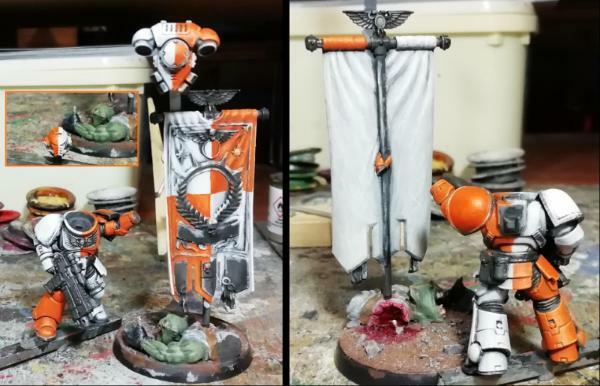 Definitely considering stealing that flag in the Ork basing idea, brilliant! Plaguecaster looks great, like that you've made the staff look diseased. Love the filthy rainbow. Awesome. And final photos of the Malignant Plaguecaster. Here he is again for scale with a little side-project. Someone liked the robin earrings I made a while back and asked if I could make a pin. And I'm now considering colour schemes for the Ancient. May post some options later. 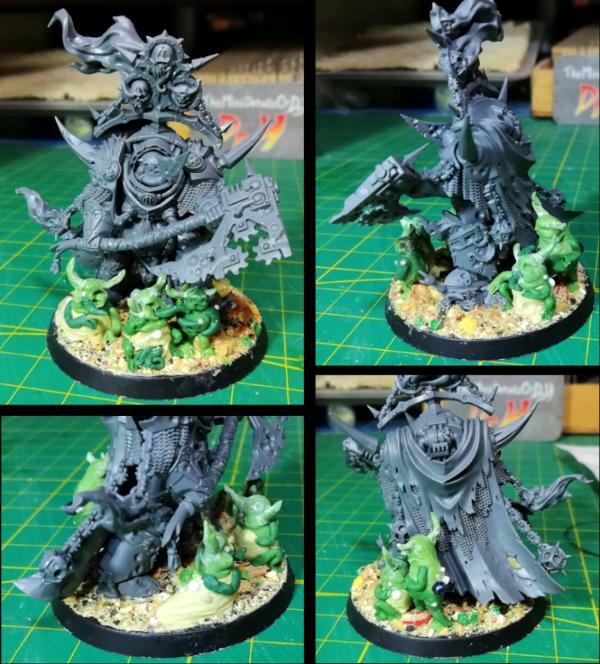 Subject: Re:The (Mini) Details of Dr H: Now Building: Lord of contagion / Now Painting: Ancient. Anyway, I said I was considering half/quartered schemes for the Ancient. Looking through the existing chapters* I've narrowed it down to 4 possible options. * "existing" as in what schemes I can find on "official" all-the-chapters posters/pictures. There's little you can do to modify it without re-building large portions (and if you're going that far, what's the point of using this model to start from). On top of that, it's basically impossible to paint the miniature in one piece if you want to do a half-decent job of it. So, the plan is to paint him in 3 parts: body and legs, arms and axe, and the backpack and cloak. The only other thing I can do with it is to add to the basing; therefore I've stuck the body and legs to the base and will add many Nurglings about him as he's already modelled with a pile of Nurglings under one foot (and it makes no sense that the only place there are Nurglings is under that one foot). 1. No, makes me want to drink a sprite and I’m not that interested. 2. yes, because all primary colors are involved even though yellow and red are mixed to make the orange. 4. Okay, but only because I worked at Home Depot and those were the main colors. Thanks Theo'. DDakka seeming quiet all over at the mo. So, on the whole a fan of orange then... noted. Anyone else have any thoughts on the colour scheme. As I mentioned, the plan is to add Nurglings to the base. First is the 3 main Nurglings (there will be some more). 2 blobs of GS/milliput added to top, small blob first squashed flat and larger blob on top, sculpted to rough head shape. Give the double-chin effect. > let cure. Small sausages of GS, tapering to one end, crimped at middle and towards thinner end. These are legs; thigh to middle crimp and shin to second crimp, foot on end. Then push, with a tool, the second crimp towards the thick end, bending the leg at the first crimp. Add toes as best you can into the little foot piece. I also made one of them slug-like (or Jabba-like if you will) for a change. Next I will add a couple more with these to support them, and then give them all arms at the same time. More details, to be added later, should make them look better than these rough sculpts do at the moment. It's funny you should say this, as I just ordered a Lord of Contagion to convert into a Slaanesh terminator lord Plan is to strip out a lot of details, fill in bullet holes, swap his gut out for abs, swap his head out for a possessed one, etc, etc. Personally super excited. For a personal project, yeah it's possible. It's just a lot of work for little return if you intend to sell it at a respectable price, as I do here. Can you get Lordy here as a separate (multi-part) model, or are you buying one from the Dark Imperium set, as this one is? Yes, they are easier to put together than a multi-part kit model, if you just want a gaming piece (not a model). They do go together well, with little to no gap, but there's so much going on they're not really good for a "starter" modeller. Things like Lordy must be really intimidating for a novice painter. When you build a multi-part kit (or scratch-build something) you can add just as much detail as you get on this, but because you've added it one at a time, you know what's there. You easily put together the 7 "parts" of Lordy, but when you look at the finished miniature and start to decide how to paint it, you are assaulted with more and more detail the harder you look. You can be painting one piece and then find something new part-way through and that can change plans, and you don't even know what this new thing is immediately. And then coupled with that, the exaggerated posing means much of the finished model is difficult to get to. Not something a novice would think of when they are building all the miniatures so they can play now and paint later. And for converters, it adds work when GW makes many of these impossible poses: A knee will be bent but where 2 pieces of armour clash and would either need to move or will prevent the pose, they just "overlap" the pieces (pushing one inside the other). This means if you cut the joint to change the pose you have to re-build the removed part of at least one of the armour pieces. And GW does this across the whole model. This is what I mean about having to rebuild large portions of a model if you want to change something. For an experienced modeller, with all the time in the world, it's not a problem. But for a novice, or someone with limited time (by RL or for what I'm doing), it can be a big restriction. Good luck with your conversion though, sounds fun. 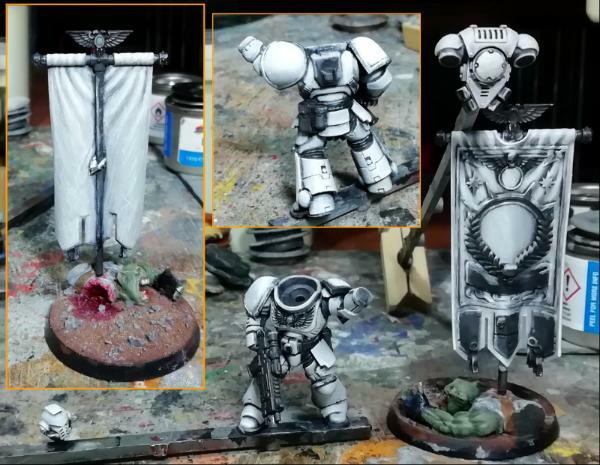 And stick around for the final miniature from this box (still some marines to do first) where I'll let myself off the leash and go for a major conversion on the largest model in the box. 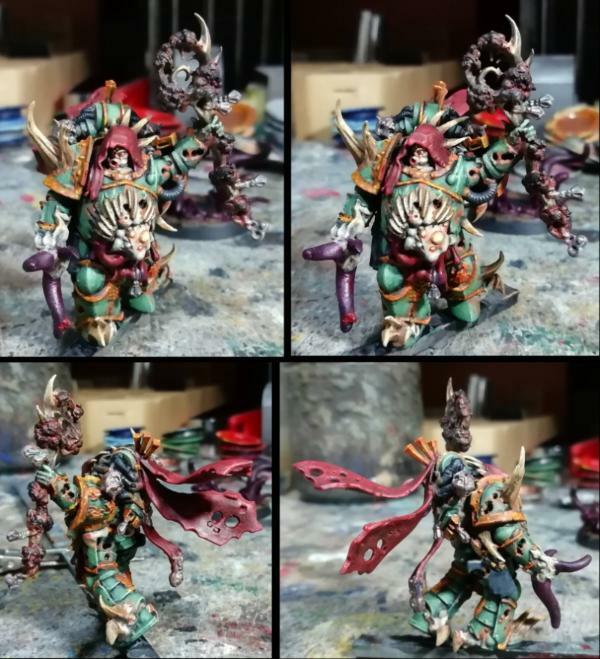 Subject: The (Mini) Details of Dr H: Now Building: Lord of contagion / Now Painting: Ancient. 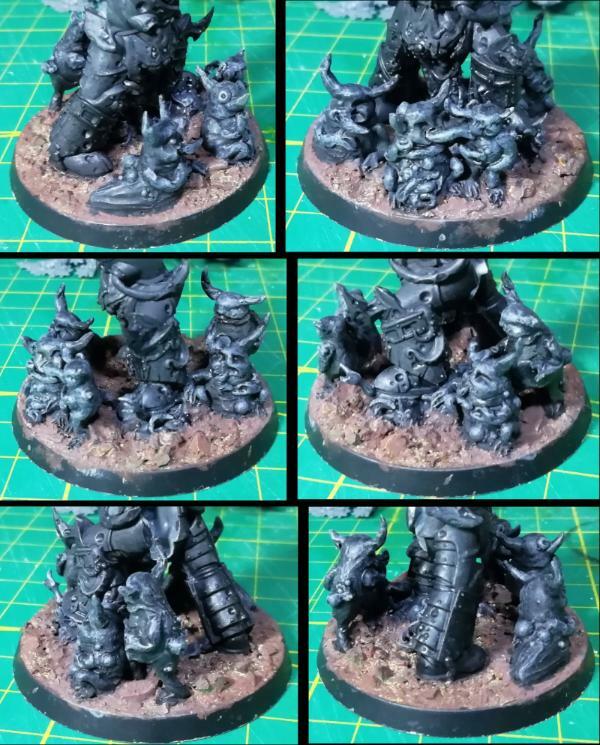 Looking forward to seeing how your Nurglings turn out. If you're still taking colour scheme votes, I like the blue and orange. Thanks Aku', so do I. Those nurglings look like fun, and kudos on making the ork look like it's dead! I love the Nurglings. 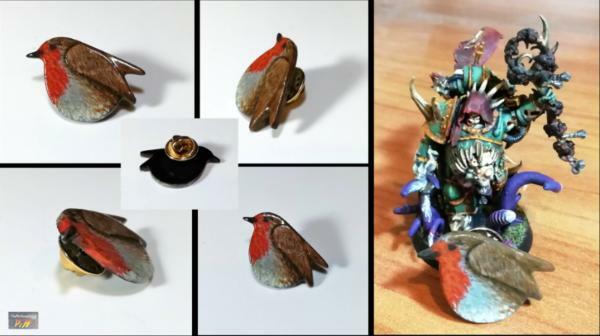 I've been thinking about how to make some, and how to do an armourium cherub, so things like this are very useful. I agree with you about the frustrations that come from the poses of a lot of the newer stuff. Blue and Black, maybe. Not thrilled but not bad. Orange and White... Rebel scum. Thanks CK. A flat front to the body and something to span the gap to the head, and putty to bring it all together in one piece. 2nd arm "conveniently missing" so that it doesn't get in the way of placing the Ancient. 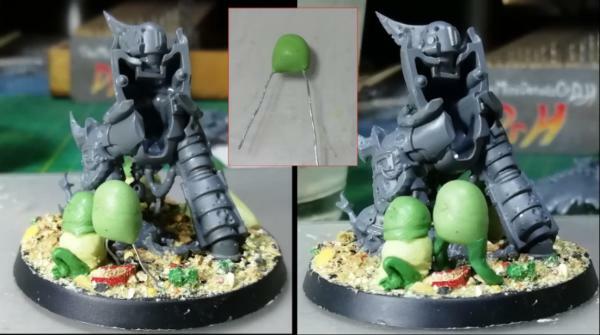 Nurglings are basically just blobs on blobs with either bits missing or more blobs added. You can get away with being quick and dirty with them and hide the sins with pus etc. For a cherub, I'd probably carve it from something. But that's because I'm more comfortable with carving than sculpting like these. Whenever I've sculpted something I always go in later and carve in more details / improve the shape. This is why I decided to show these from the start; to show that everything goes through an "ugly" stage before improving. We all learn together how to make these (I'm just making it up as I go). So now we have sprite and Irn bru for the first 2 possible Ancient schemes, anyone got a drinks brand that matches the last 2? Drilled some wire through their heads and added putty for horns (bit of superglue used to help it stick, hence the white). Probably a better result would have come from carving plastic down and sticking them on, but here we are. Those were carved down a bit, and then arms and tongues were added. The little chap beneath the axe is going to be covered with blood dripping from the axe and the one next to him is licking it off. Still going strong I see . 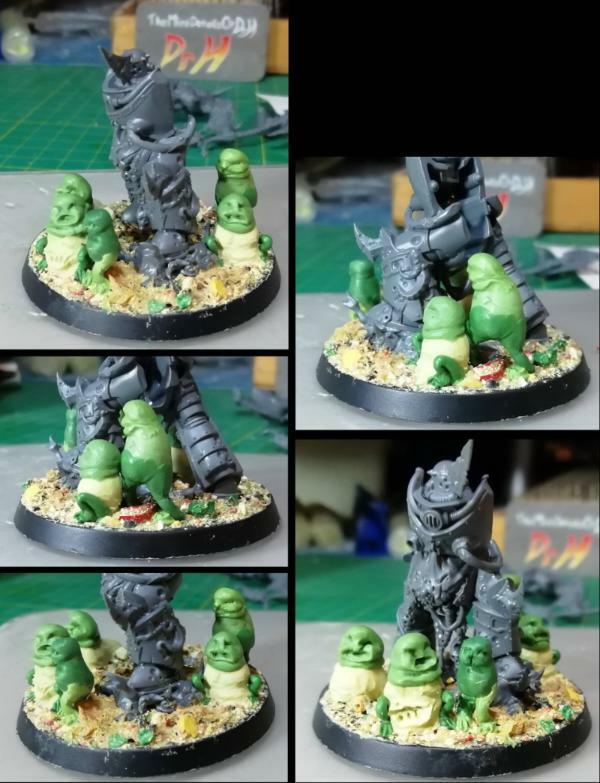 Loving the step-by-step on the nurglings. Thanks Graven' and no problem. Thanks CK, yes, still plodding along. Next stage on the Nurglings was to add the boils and details. 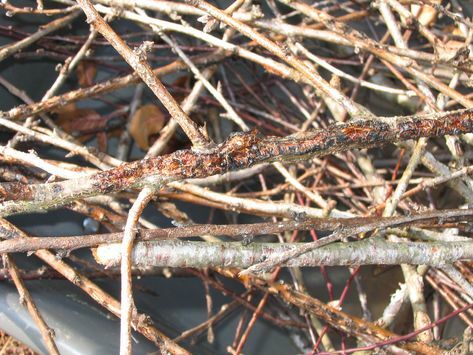 The boils are a variety of beads that are glued into drilled recesses. The excess glue helps in this case by giving an uneven, but natural, edge about the boil (rather than trying to keep it neat and tidy for rivets done with this technique). Hey Doc, beaut work on those grubby little nurglings. They've got that old school nurgling vibe of just being disgusting little blobs of gak and filth that the new ones just dont have. 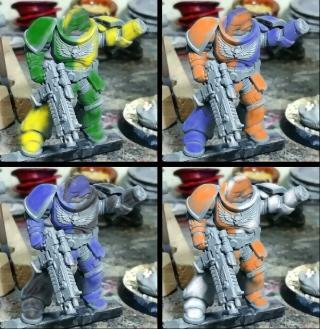 If it's not to late to vote on the primaris colours, I'd go Orange/White. But make it a grey white rather then a white white. On the Nurglings, I can't see anything drastic that I want to change on them (at least nothing that is short of re-doing them entirely), so they and Lordy have moved to the painting desk to await the Ancient being finshed. For the Ancient. Not too late considering you chose the correct option, but simultaneously late as I've painted the white in antisi.... ....pation of white being one of the colours or any other colour wanting a bright base. There are a few rough patches (they will be fixed / hidden), but I did try to give the banner a fabric texture with some fine lines on the flat surfaces. I'll now decide upon the quarters and paint over the relevant parts with orange before tidying up the black edges/lines and doing the non-orange/white parts. The Captain will, like Lordy before him, likely be stock. So will need a nice base theme. The Lt's may have options for re-posing. Then there's only the final Nurgle model left from the box. Yeah, that works for me. More to do on that and in reality the orange is slightly more yellow than it appears in this photo, but that will be pushed further anyway with the next coats. I've come across a curious thing on Twitter. I follow a lot of artists of various media and I've seen a few comment to the point that unsolicited critique is rude. No matter what you say or how you say it, if it's not asked for it's rude (full-stop). This is, as I'm sure you all here are aware of, not something I'm familiar with. I like to receive feedback, good or bad, on any and all of my work. I see it as a good way to learn. The critic is not informed in the art-form / they are not an expert in the field / don't know what they are talking about. (everyone can have an opinion on anything as subjective as art, as I see it). The critique comes out of the blue with no prior conversation. Often compared to stopping someone on the street and critiquing their outfit (not a comparison I agree with). I also get the impression that much of the feedback they have received in this way is not worded politely either. Which can lead to leaving a bad taste in the mouth of the artist about receiving any feedback this way. If you feel the need to critique someone's work be sure to use the feedback sandwich technique; something good, critique, something good. Your critique should avoid words like "bad" or "wrong" that make it seem like a fact, and should be phrased as an opinion (as that is what it is). Your critique should include how you think it could be improved (and not "how it should be fixed"). If you don't know how it could be improved, probably stick to just mentioning what you like about the piece and skip the critique. Be polite. Rude feedback is always rude. And be aware, that the artist doesn't have to follow your advice. It's their art and they can do what they want. Their's (and other's) opinions may differ from your's, and they are all valid. I've left quite a long thread on my thoughts on my Twitter page also. And with a second coat of orange and highlights. 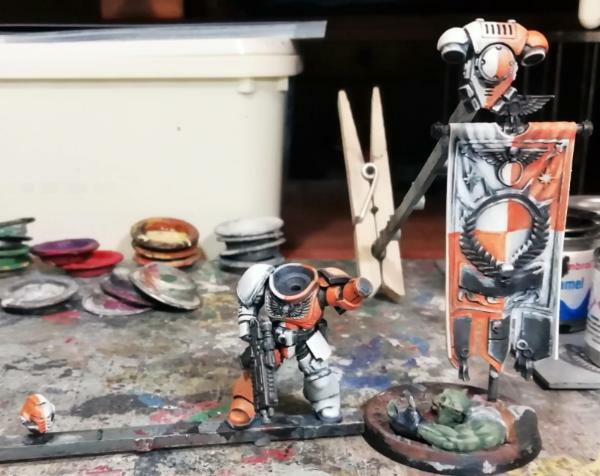 I left the back of the banner white so that his arm will contrast with something (as the scheme will mean that lower corner would also be orange). As I said, clean-up next and then the other colours. Pop over, like things, share things, leave comments. Social media . I’m a gaming dork who lives in a cave. Give me a length of string and a Campbell’s soup can (preferably full with pork and beans), cause that’s how I communicate . Quick question on orange/white ancient. Is his quartering supposed to be opposite of the test sample figure because he’s a veteran? Otherwise his armor is looking great .